The visit to the Museum begins with an explanation of the origins of Girona's Jewish community. Here we shall journey with the Jewish People from ancient times onwards, accompanying them in their trials. Taking as starting point the persecution at the time of the Roman Empire, the Jewish People was scattered throughout the Mediterranean, in a wandering journey without end. The first families settled in the city as early as the 9th century, forming a community with its own life and identity. Detail of the inner panel. 1st century A.D., Roman forum (Italy). Reproduction. This detail shows the looting after the destruction of the Temple of Jerusalem by the Roman armies, in AD 70. 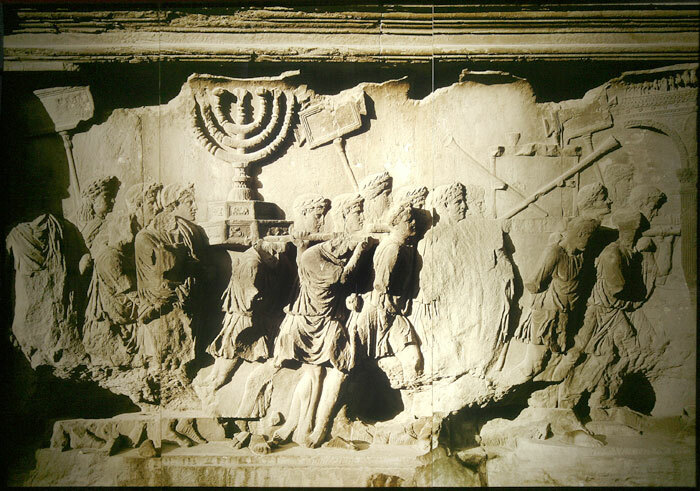 The Arch of Titus has become the symbol of the Jewish Diaspora throughout the Mediterranean.